1916, 2¢ carmine, type II, coil (Scott 487), joint line pair, o.g., never hinged, fabulous well centered line pair in immaculate mint condition, quite scarce like this this, Extremely Fine, 2002 P.S.E. certificate graded XF-90 (1 of 4 line pairs attaining this impressive grade, with only 3 others currenetly grading higher). SMQ $575 in the grade of XF-90. Scott $275. Estimate value $350 – 500. 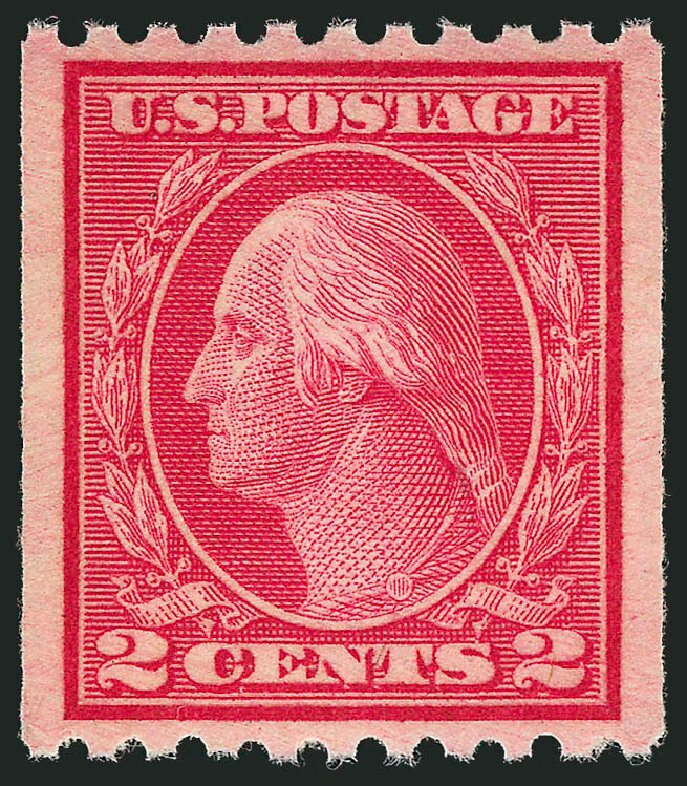 U.S.; General Issues, 1916, 2¢ carmine, type II, coil, #487. Line pair, n.h., Just Fine, PSAG (2014) cert. Scott $275. Estimate price $100. 1916, 2¢ carmine, type II, coil (Scott 487), pair, o.g., never hinged, sensational GEM QUALITY pair, perfectly centered with warm rich color, a true condition when found in this marvelous mint state, Superb, 2008 P.S.E. certificate graded SUP-98 (1 of 9 pairs achieving this impressive grade, with only one other pair grading higher). SMQ $550 in the grade of Sup-98. Scott $65. Estimate price $500 – 750. 1916, 2¢ carmine, type II, coil (Scott 487), pair, o.g., never hinged, astounding GEM condition, perfect centering and vibrant rich color, one of the most impressive multiples you’ll ever see, Superb, 2014 P.S.E. certificate graded SUP-98. SMQ $550 in the grade of Sup-98. Scott $65. Estimate value $400 – 600. Scott #487, 2c Carmine coil, Ty. II, perf. 10 horiz., exceedingly choice used single, deep intense color and impression, perfectly centered with large margins, neat portion of machine cancel, extremely fine gem; 2014 PSE certificate (Superb 98; SMQ price $50.00 for 90, the highest grade for which a single is priced); this is the highest grade awarded for any used #487 single, this being the only example to reach this lofty grade. Scott #487, 2c Carmine coil, Ty. II, perf. 10 horiz., exceedingly choice used pair, deep intense color and impression, exceptionally well centered and margined, neat Fayette, Indiana cancel, extremely fine; 2013 PSE certificate (XF-Superb 95; SMQ price $140.00 for 90, the highest grade for which a used pair is priced); this is the highest grade awarded for any used #487, this being one of only two 95’s, both pairs. Scott #487, 2c Carmine coil, Ty. II, perf. 10 horiz., well centered used pair, rich vibrant color, attractively cancelled, extremely fine; a surprisingly difficult used coil pair; 2013 PSE certificate (XF 90; SMQ price $140.00). 1916, 2¢ carmine, type II, coil (487), vertical pair, o.g., never hinged, handsome well centered multiple, with gorgeous color, Very Fine to Extremely Fine, 1980 P.F. certificate. Scott $65. Estimate value $50 – 75. 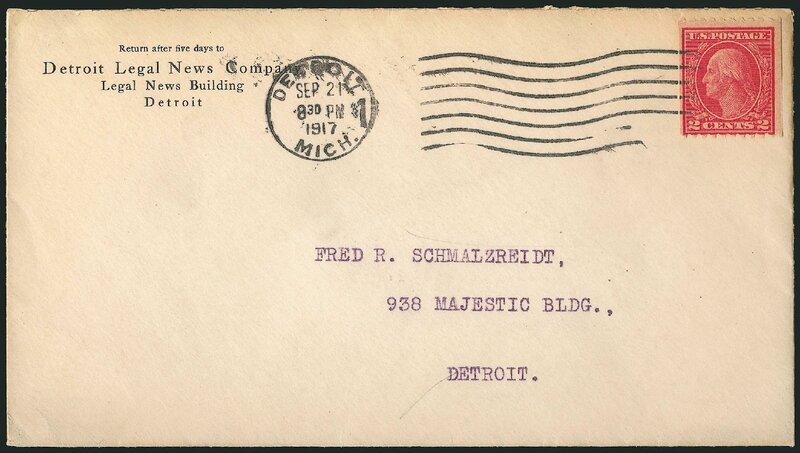 1916, 2¢ carmine, type II, coil (Scott 487), vertical pair, o.g., never hinged, tremendous top quality multiple, with warm rich color and beautiful centering, Extremely Fine to Superb, 2012 P.S.E. certificate graded XF-SUP-95, 1 of 12 pairs attaining this grade, with only 8 others grading higher. SMQ $195. Scott $65. Estimate value $150 – 200. 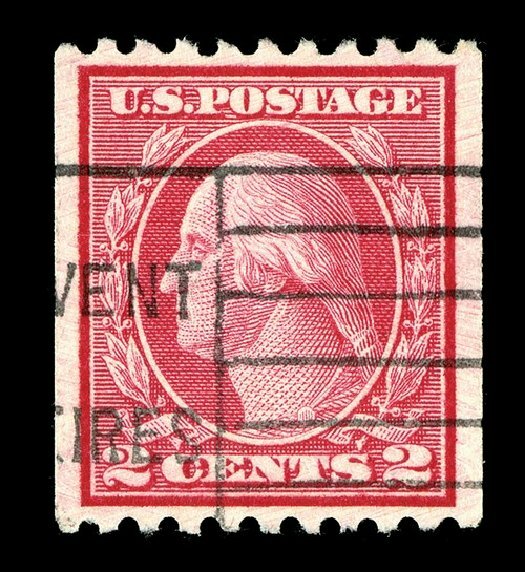 U.S.; General Issues, 1916, 2¢ carmine, type II, line pair, Scott #487. N.h., Fine, Weiss (2012) cert. Estimate price $100.